Mayor Sharon Konopa was in favor of weekly yard debris service, but the council again voted it down. For the second time, the Albany City Council has rejected Republic Services’ proposal to collect yard debris weekly instead of every other week. The council majority didn’t think it was right to impose extra expense on people who don’t need the more frequent service, especially since customers can obtain a second yard waste cart now if they’re willing to pay $9 more per month. No vote was taken at Monday’s council work session. But after some extended discussion, Councilman Bill Coburn said he didn’t sense there were enough votes for approval. 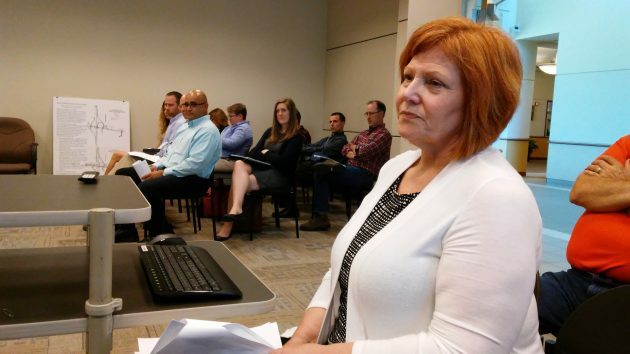 Mayor Sharon Konopa, who arrived from another engagement toward the end of the discussion, favored weekly pickup of yard debris last fall, when the council first rejected it, and again Monday. She urged the council to consider what’s best for the community in the long run. 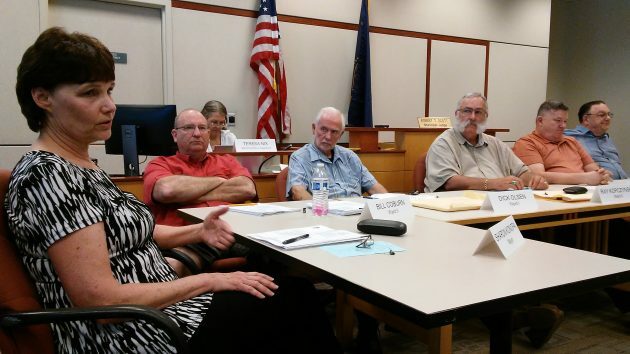 Republic’s Julie Jackson speaks to the council Monday while city staff members listen in the backround. Julie Jackson of Republic Services was in the tough position of presenting the proposal. Once it was offered, weekly pickup would be mandatory for all of the disposal company’s roughly 14,000 customers, she said, and all would have to pay $4.50 more per month. Last fall the increase would have been $3, but conditions have changed. About 600 of Republic’s Albany customers have asked for an additional cart for yard debris because one isn’t enough for their needs. They pay the $9 surcharge, but their carts are still picked up every other week. Weekly pickup would allow the disposal of food scraps, which then would be turned into compost along with the yard debris. But food waste composting is not considered feasible when the waste may sit there for two weeks. Councilman Rich Kellum said it would not make sense to stick 13,400 customers with having to pay $4.50 more in order to let 600 others save the same amount. He might think otherwise, he allowed, if two or three thousand wanted the weekly service bad enough to pay more. Whew. Perhaps the council should have taken an informal straw poll before bringing this back and UP. Could have saved the nice, corporate spokeswoman a trip. More importantly a few hours of her life no doubt. I do thank you all though for the HH-today subject matter. Carry on. Sorry, I was vague. I meant the council should have taken a straw poll weeks before the meeting. Y’all would have realized it was going nowhere and deleted this item from the agenda. To answer Councilman Sykes? question; the reason they have to ask permission for a rate hike is that they are not a typical business. They have a monopoly on the trash business in Albany granted by the City of Albany. Their customers are not free to select a different service provider if they so desire. Thus the City Council acts as a “protector” of it’s citizen/customers from a potentially predatory service provider. An example of Denver was mentioned where they have 7 different companies competing for the “business.” You have multiple garbage trucks going up.down residential streets… Very-very inefficient (and noisy) to say the least! So, why not make it optional to get weekly pick up for $4.50 a month? I wouldn’t pay $9 more to have an extra bulky cart cluttering my walkway…but $5 to have the same cart emptied might also encourage me to do more yard work and maintenance…improving the neighborhood overall. Before you say that wouldn’t work, they have a list liked houses they have to pick up and drop off new carts, they could make a list of homes that have extra pick up scheduled granted that’s a pain, if they could make it$3 a month it would be ok to add on to every bill. I will add, not everyone recycles, but we still pay for that service..I recycle I’m just making a point. I called Republic on Monday to see if I could get my cost per month lowered. I am on Social Security and don’t have the funds to pay for a service I barely use. I asked if there was a senior discount first. Then told the person on the other end of line that I put my waste can out when it got full, once every 3 weeks. I recycle and I put it out once every 6 weeks if that. The yard waste container one time in 9 months. She explained to me that there is a service they provide which is $4.00 less, But that is not much of a saving which also means pickup may not be often enough. I’m just saying that it would be nice if those of us who can least afford a rate hike, and don’t use the service fully as it is could get a lower rate. I’m not sure if others are aware of situations like mine. In Corvallis they use different colored lids on the cans to indicate which pick-up schedule people have. I have a friend who has her garbage picked up every two weeks in Corvallis by Republic and the lid of her can is different from her neighbors who have weekly pick-up. So it wouldn’t be a hard thing to offer as an option. Whenever a company has a monopoly like Republic has, anytime that monopoly-holder proposes something that includes a rate hike, you can bet the corporate leaders have determined they need to make more money out of the Albany market. Equally likely is that sometime in the not-too-distant future, Republic will attempt to hold-up Albany with the threat of leaving if they can’t get more money. As to the mayor and her desire that the council consider “what’s best for the community,” all one need do is recall that this same mayor used that “best for the community” line when she and her fellow Council travelers vetoed the will of Albany voters in 2014 when the Council voted to not allow recreational cannabis shops despite the direct vote of the citizens. The mayor’s belief that only she understands “what’s best” is remarkably ham-handed and out of touch. When elected representatives say they know better, that’s the time to find new elected representatives. The difference between the $9 (current) fee for extra pickup and the $4.50 proposed fee shows what subsidy the non-users of weekly yard debris pickup would have had to pay if the plan had been approved. Until the monkey can be kept off the back of non-users (and the Corvallis plan sounds good to me), the Council does the right thing by rejecting weekly pickup. Why put your grass clippings in the yard waste bin and why rake them. Most newer mowers have the mulching capability so all you have to do is mow at least once a week. Twice a week is better. The council got this one right. Thank you. Observations 13,400 x 4.50 == $60,300 per month extra that this would have cost citizens. 60,000 x 12 = $720,000 per year. This seems like a lot to promote composting of kitchen waste. People so inclined can set up composting bins in a corner of their yards now and compost much of their kitchen waste already. The fact that it went from $3.00 to $4.50 in the past year is evidence that if that had been place, I expect they would have asked for a rate increase this year. That is, this cost will just keep rising on top of what we currrently pay. I too did not understand Sykes question as reported. There is a difference between offering a service, such as the extra cart for the 600 citizens who have asked for it, and mandating that every one must have an extra cart and mandating the cost. It seems clear. Perhaps I misunderstood what he was questioning. Mark me down as not wanting to pay extra for our garbage service. It works great the way the service is now.